Polar is a name that’s synonymous with fitness technology. In fact, it’s safe to say that Polar is responsible for the widespread use of heart rate monitors that we see today. But one of the best things about Polar as a company is that it’s always looking forward, rather than resting on its not insignificant laurels. And while Polar’s history lies in heart rate monitors, its present lies firmly in the realm of the fitness computer. 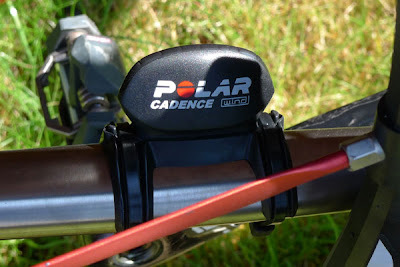 Although many of Polar’s devices can be used for a multitude of fitness activities, today I’m looking at one that’s targeted firmly at the serious cyclist. The Polar CS500 is a fully featured cycle computer that’s designed to help you get the most out of every ride, and monitor your performance over each minute and every mile. But does the CS500 stand out from the ever increasing crowd of cycle computers on the market? The basic CS500 ships with the device itself, a chest strap, a corresponding heart rate sensor and a speed sensor. The CS500cad, which Polar sent to me for review, throws in a cadence sensor as well. You also get a bike mount for the CS500, which can be fixed to either the handlebars or stem, while you’ll also find everything you need to mount the sensors and magnets. All the sensors use Polar’s W.I.N.D. 2.4GHz wireless technology, which should mean that you won’t experience any unwanted interference, no matter how many riders are in your group. The heart rate sensor has a user replaceable battery, but the speed and cadence sensors are sealed units. Polar estimates that you’ll get 3,000 hours of use out of both the cadence and speed sensors, after which they will have to be replaced. 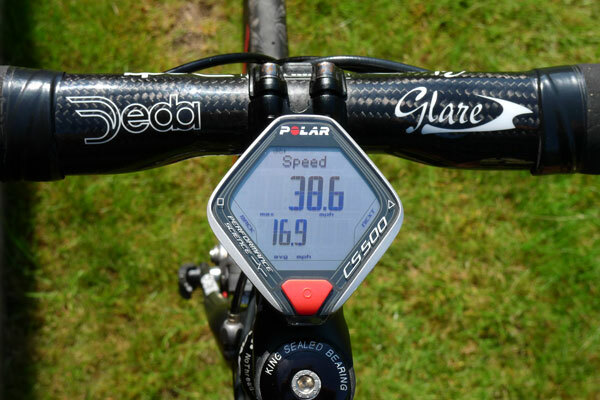 I usually don’t like sealed units, but the sensors are pretty small as a result, and going by Polar’s estimate, you’d get over four years of use from the sensors if you rode for two hours a day, seven days a week. Spending another £70 on new sensors after four years isn’t bad, and no doubt many riders will be looking to buy a new cycle computer by then anyway. The good thing about buying all the sensors in a bundle with the CS500 is that you don’t have to teach them all to play nicely together. The bundled sensors are already paired with the CS500, which makes set-up that bit simpler. One thing that doesn’t come in the box is a Polar DataLink dongle, which is a real shame since you really need one of these. 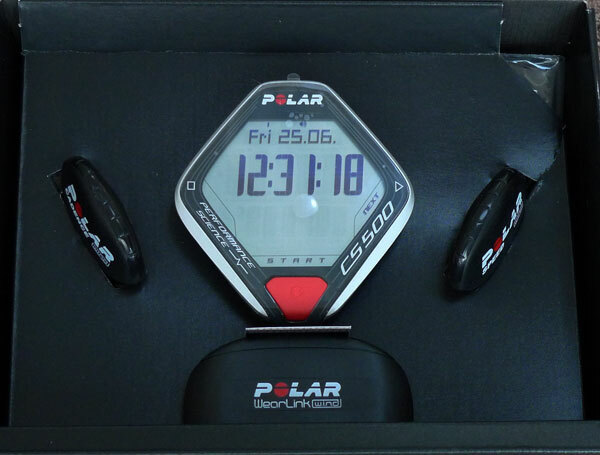 The DataLink will cost you around £45 and allows you to wirelessly transfer all the data recorded on the CS500 to the Polar Personal Trainer website. Believe me when I say that this is an essential piece of the puzzle, and I’ll tell you why a little later in this review. The bike mount that ships with the CS500 does its job beautifully. The mount itself is strapped to a rubber collar that wraps around your stem or handlebars using two supplied cable ties. I decided to strap the mount to my stem, thus maintaining the symmetry of my cockpit. This makes it easier to glance down and take readings from the CS500, although some would argue that it means you have to take a hand off the bars to operate the device. That is true, but the CS500 is just so easy to use on the move, that its positioning is barely a consideration. The speed sensor is mounted on the forks – in my case, on the right hand side. Again you’ve got a rubber collar that wraps around the fork, while cable ties secure the sensor to the collar and the fork. If you’re running carbon forks, it’s worth wrapping some tape around the fork before mounting the speed sensor, since cable ties can damage the carbon weave over time. 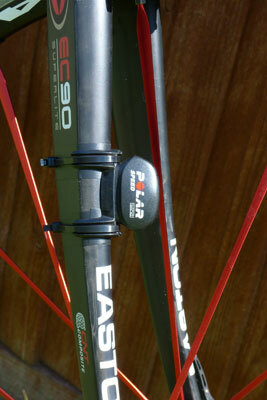 The corresponding magnet is then fastened to one of the wheel spokes using the integrated screw. The distance between the magnet and the sensor as the wheel rotates needs to be about 4mm, so there’s a bit of adjustment to do before you tighten everything up. 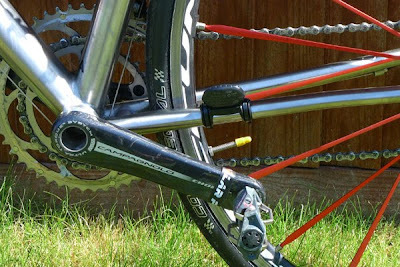 The cadence sensor is mounted on the non-drive-side chainstay, keeping it clear of the chain and avoiding any damage that could be caused by it. The cadence sensor uses the same type of rubber collar as the speed sensor, although it can be a little tricky to mount if you have oversized or unusually shaped chainstays. 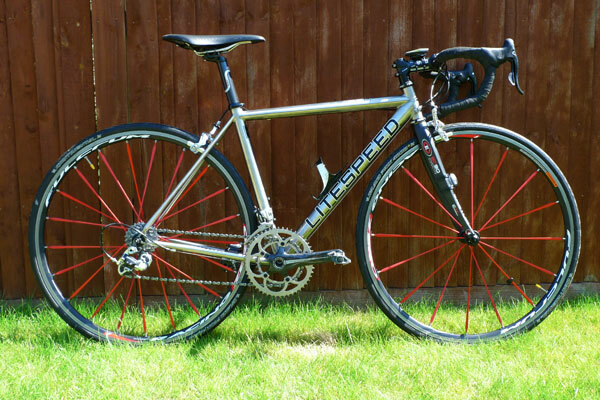 The chainstays on my Litespeed Icon are both oversized and unusually shaped, so it took a little time to get the sensor lined up properly and secured. However, once it’s done, it’s done for good. The magnet for the cadence sensor mounts to the inside of the left crank, and is secured with a double sided sticky pad. But just to be safe, Polar also supplies a length of tape to wrap around the crank and make sure that the magnet stays in place. Again, the magnet needs to be within 4mm of the sensor as it passes, so a little fiddling around is necessary before tightening up cable ties and wrapping tape. Once all the sensors and magnets are correctly in place, you’ll need to input your bike’s data into the CS500. You can simply read the wheel measurement from your tyre rim and use the table in the manual, but the best way to get an accurate measurement is to do it manually. You can have up to three bikes associated with the CS500, which means that you can use the same device for your road bike, your mountain bike and even your commuter bike, ensuring that every mile you ride is logged. I’m not sure how much money Polar spent on the design of the CS500, but whatever it cost, it was worth every penny. I’ve spent the past couple of weeks using the CS500 and I’m struggling to think of anything that I would change – Polar has literally hit the bull’s-eye when it comes to design and usability. For a start, the CS500 is a large unit – 67 x 75mm (WxH) – with a correspondingly large screen. This instantly makes it more usable than any wrist based fitness computer wrapped around a mount on your handlebars. The CS500 has been designed so that you can read what’s on the screen with the slightest glance, which is handy when you’re hurtling along at 40mph! The screen can display three lines of information – the middle line offers the largest readout, with supplementary information displayed above and below. But even the smallest, top-line readout is easy enough to see while on the bike. Of course no matter how big the screen, no device can ever display all the information that’s being recorded at once. While you’re riding the CS500 has a plethora of real time information at its disposal, along with an array of different screens on which to display them. 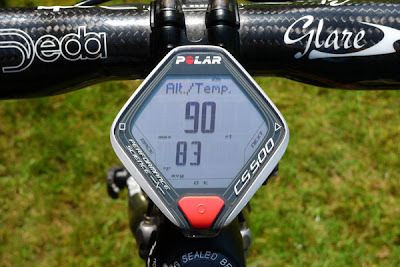 However, this is a traditional weakness of any cycle computer, since switching between displays can often be tricky, if not downright dangerous while you’re riding. But the design gurus at Polar have put their thinking caps on and not only addressed this problem, but pretty much solved it. At first glance it looks like the CS500 has just one bright red button mounted at the front. This is in line with Polar’s traditional design of having a large Start/Lap button that’s easy to access no matter how hard you’re training. However, there are actually two other buttons located at the rear of the unit, which are somewhat fiddly to access when you’re holding the CS500 in your hand. However, when the device is mounted on your bike, you’ll realise that positioning those buttons at the rear is in fact, a stroke of genius. The CS500 attaches to the bike mount via vertically centred metal rods. This mounting mechanism allows the CS500 to rock left or right on its mounting points and in doing so will allow the buttons at the rear to be pressed. So, in essence, you simply have to push the left or right side of the CS500 in order to activate the corresponding rear buttons. This makes the device an absolute joy to use while riding, since you don’t have to find a fiddly button on the side of the device in order to flip between displays. Pressing the right side of the CS500 will scroll through the different displays and allow you to check, say, the calories you’ve burned so far or the amount of climbing you’ve done. The left button will pause your current session, while pressing it again will end your session and save the data. One slight annoyance is that the CS500 rattles or buzzes a little when you’re riding over less than smooth roads. It’s hardly a deal breaker, and I completely tuned it out about halfway into my first ride with the device, but it does jar at first. Ultimately though, this is a small price to pay for that high-speed usability. The CS500 can only store a maximum of 14 training sessions before the oldest session is deleted in favour of a new one. So, unless you enjoy manually transferring all your data to a spreadsheet, you’re going to need to invest in a DataLink dongle. The DataLink dongle plugs into a USB port on your computer and connects to the CS500 using the same 2.4GHz W.I.N.D. link as the sensors. 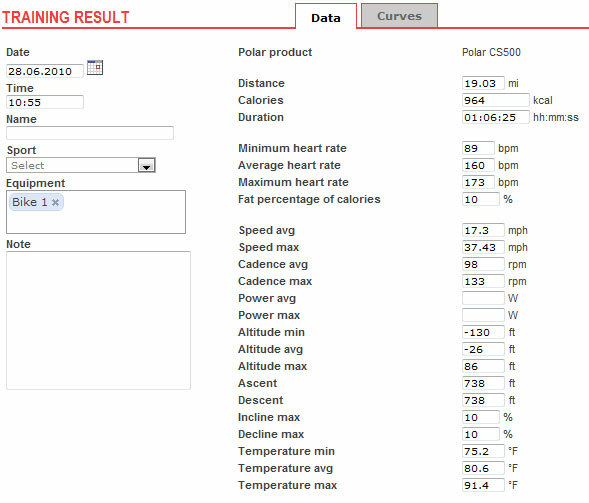 It then transfers all your recorded data to www.polarpersonaltrainer.com – well that’s the theory anyway. When I first tried to get my CS500 to synchronise it simply refused to work, telling me that it had lost the connection. But a quick email to Polar with the error message and my sync log resulted in a replacement DataLink cable arriving at my door the following day. Since using the new DataLink I’ve had no problems synchronising the data from the CS500. In order to sync the CS500 it needs to be switched on, and you need to be running Polar’s WebSync utility on your computer. Then, as soon as you plug the DataLink dongle into your computer, all the data should be pulled off your CS500 and uploaded to the Polar Personal Trainer website. It’s worth remembering that the sync process is bidirectional, so if you change anything on the website (like your weight, height, training programme etc.) that will be transferred to the CS500 too. The Polar Personal Trainer site is a great little resource, especially since it’s free. 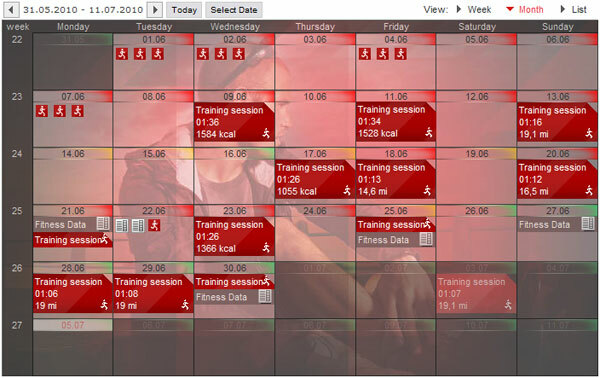 Here you can track your progress over time, and view all your training sessions laid out in a diary form. One recent update that Polar has made is the Training Load feature, which gives you an indication of how hard you’ve been training and whether you should take a break or train again the following day. The slight tint in the corner of the date box in the diary screen indicates the Training Load – Red means you should rest, Yellow means that you should train with caution and Green means that you’re fine to train hard. 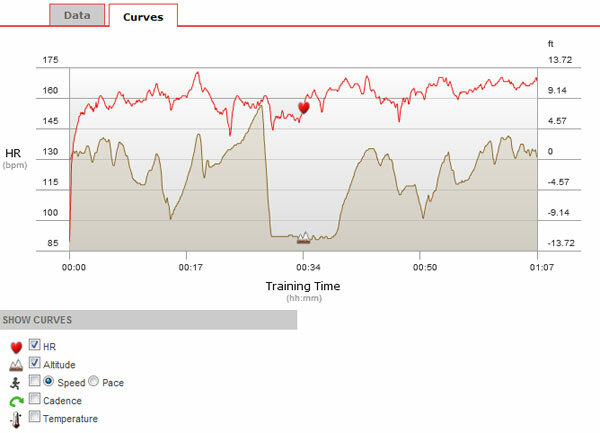 If you click a training session on your diary you’ll get the full breakdown of all the captured data from your ride. This will include maximum heart rate, average heart rate, average speed, average cadence, climbing elevation and so on. More interesting is that this data can also be displayed over the duration of the ride in the form of a graph. Switching to the Curves readout gives you the ability to show your heart rate, speed, cadence, pace, altitude and even the temperature over the duration of the training session. This is particularly useful if you’re trying to improve your performance over a specific section of a regular ride route. There’s a very active community on the Polar Personal Trainer site too, and you should be able to find the answers to most questions in the forum, where other users and Polar staff are quick to answer queries. You can also create or join in on challenges, where you compete with other Polar users to hit a set number of burned calories or cycled miles or km. The Polar CS500 is a superb cycle computer in almost every respect. With sensors for heart rate, speed and cadence, you’ve got pretty much all the data you could ever need to improve and maximize your performance on your bike and the integration with the Polar Personal Trainer website makes it very simple to track your progress. But it’s the superb design and usability of the CS500 that really sets it apart from the crowd. The large screen makes it simple to see your progress even with the slightest glance, while the rocking mechanism for pressing the buttons is a simple, yet brilliant idea. With a street price of around £270 for the CS500cad bundle, this isn’t a cheap bit of kit. That said, if your main pursuit is cycling, and you spend as much time on your bike as you can each week, then it’s a price worth paying. Bundled heart rate, cadence and speed sensors. Good integration with Polar website. 2.4GHz wireless technology with no interference. Easy and secure bike mounts. DataLink dongle should come in the box. Slight rattle from device/mount when riding. Only stores 14 training sessions.